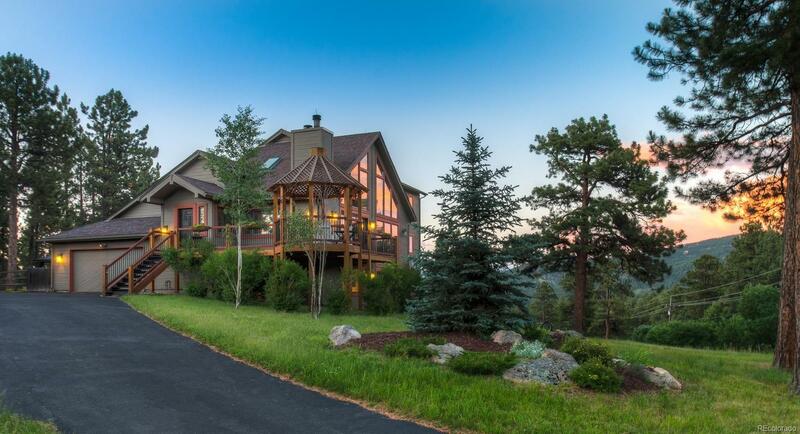 Your Own Colorado Mountain Retreat!! 45 min from downtown Denver and only 7 min. to the historic Downtown Evergreen! You wonât want to leave the peaceful, quiet setting, surrounded by trees & jaw-dropping views! Open & inviting, this home was extensively remodeled with high-end updates throughout including appliances, hickory floors, designer fixtures, granite counters & fresh paint. The wrap-around Trex deck w/ automatic lighting, covered stone patio, hot tub & lighted gazebo make outdoor living as nice as inside! Second level spacious master suite includes a sitting area & spa-like bath, walk-in closet with custom built-ins & French-door access to private upper deck. Light & bright walkout basement includes additional bedroom/bath, family room with wood stove, office, play/craft room or 5th bedroom. 2nd garage, workshop, chicken coop & playhouse are added bonuses on the beautiful 2+ acres. Secluded but not remote, this home is ideal for parties or enjoying quality family time.